In modern home design rugs are back in a big way. With top home design programs like the Block singing their praises, everyone wants the perfect rug for their home. So here are our top 5 tips for choosing the perfect rug for your home! Rugs come in a variety of ranges and styles. Above all, the style of rug you purchase will depend on your home design, the traffic area, and your budget. 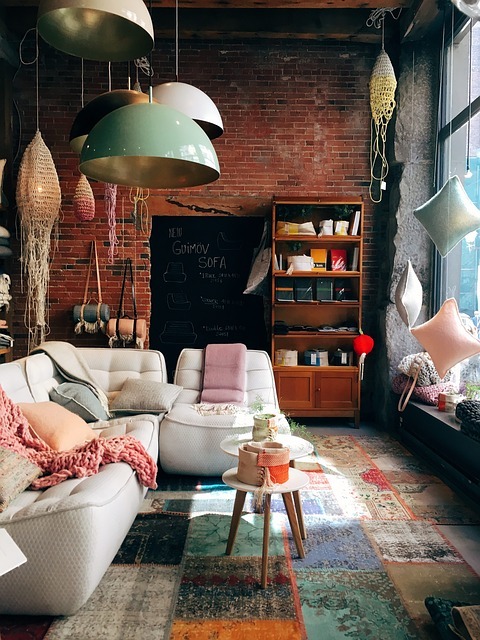 Rugs should not be an after thought for a room. Rather, they should be a separate feature in their own right that works cohesively with your furniture without blending into the background. Persian rugs are the epitome of antique rugs. Many people purchase them as show piece items for their homes and even as investments. Seen as traditional rugs, these rugs come from Persia, now known as Iran. Carpet weaving is of historical importance in the Middle East with the art form dating back to the Bronze Age. Some rugs are over 500 years old and are often bought as wall styling pieces or for low traffic rooms. Often considered the best type of antique rug, they are perfect for darker, sombre home designs. 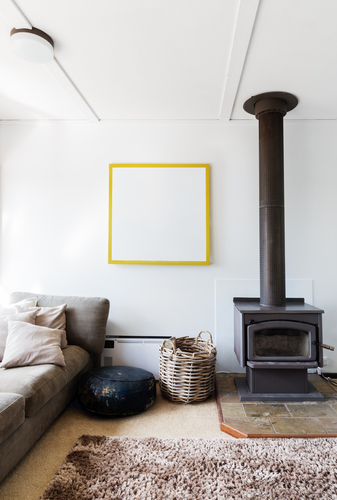 They highlight homes that are styled with authentic, natural materials and are perfect for wooden floors. Many of these rugs are created from wool, cotton, or silk. Equally famous as Persian rugs, Turkey and Iran sit side by side and as such the rug making tradition is equally important in both countries. Nomadic lifestyles meant that temporary flooring was required – and thus the birth of the modern rug. Turkish rugs are designed to insulate against the cold and range in design from humble or practical patterns to ostentatious colours. Traditional rugs are perfect for discerning home owners. Like Persian rugs, Turkish rugs are often constructed from wool, cotton, or silk. Typically wool or cotton, these rugs range from shaggy, high-pile rugs that originate from mountain areas that required warmth, while light-weight varieties come from desert environments. These rugs are wonderful for creating an exotic look combined with a soft, fluffy feel. 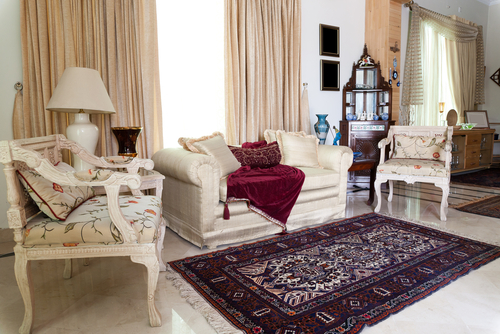 Dhurries are another type of traditional rug and commonly come from India. They are generally a more affordable traditional rug, featuring similar flat-woven techniques and motifs. They are especially well-suited to children’s rooms or offices that require a slightly more hard wearing rug as they are typically reversible. Another type of traditional, flat-woven rug similar to dhurries, kilims are typically tighter woven. Sourced from the Balkans to Pakistan, they are characterised by narrow stripes in blue, green, brown-yellow and red with small geometric designs. They are fantastic for high-traffic areas. Richly textured and durable, these rugs come in a wide range of patterns with cotton borders. These natural fibre rugs are commonly made from Indian jute, African sisal, or sea grass. These rugs suit entry ways, sunrooms, etc. Many of us remember the shag pile rug from the 60s and 70s. But shag pile dates back as far as Ancient Greece where they were originally made using strands of goat hair. Conjuring up images of the fur-lined royal suites of the past, these rugs have all the functionality of fur rugs without the ethical issues. Shag pile allows you champagne on a beer budget. As a result, you can bring warmth and comfort to a bedroom or family room with these lush companions. With the advent of home design shows, modern rugs have appeared in almost every furniture or design store. Modern rugs take advantage of synthetic fibres to create cheaper rugs that can stand up to high traffic areas. However, synthetic fibres don’t respond as well to cleaning, making them more affordable to use and replace, rather than a treasured household item. The new contenders in the field of modern fibres are Art Silk and Bamboo Silk. Growing in reputation, these fibres are effective mimics of traditional textures without the cost. Art Silk or Artificial Silk, is a synthetic fibre that is made from rayon, mercerised cotton, polyester, or a blend of these artificial fibres. They are woven to have a similar appearance and feel to true silk. Bamboo silk is, as it sounds, made from bamboo. Bamboo viscose is a type of cellulose extracted from the plant and turned into a paste. After it dries it becomes a soft, silky fibre. Bamboo silk has a soft, cool texture, is extremely durable and even boasts hypoallergenic and antimicrobial properties. For those who have ethical issues with silk worm production, bamboo silk is highly recommended! The right sized rug can make all the difference when decorating your home. A rug that is too big can overwhelm a room and make it feel small. Comparatively a rug that’s too small can make it seem like you added the rug as an afterthought, or look sparse and mean. Your rug is not a substitute for carpet in your room – it should not span from wall to wall. The best idea is to plan a room and arrange your furniture before measuring for a rug. This will give you a good idea how much space your rug will need to cover. Design-wise, rugs are great for filling empty areas in a room, or to highlight pieces of furniture. Further, larger rugs are fantastic as a centre piece for a living room or dining room. A smaller rug is the perfect accent for a bedroom where it can provide comfort. Finally, a rectangular rug is fantastic for filling large or long spaces, while a round rug can help break up harsh, modern lines in family rooms. Where you rug will be laying and the amount of traffic that area will get helps dictate the type of rug you should purchase. Rooms that see high use or high traffic – such as entry ways and children’s rooms – need to stand up to a lot of wear. Modern rugs that use synthetic fibres and dhurries, that are easily cleaned or replaced, are best for these areas. Rooms that see less wear and tear – formal sitting rooms, dining rooms and adult retreats – can benefit a more delicate rug or a deeper pile such as a traditional Persian or Turkish rug, or shag pile. Considering the pile of your rug is also an important factor. When we refer to the “pile” of a rug, it means we are discussing the density of fibres. While a thick pile might be seen as comfortable or cosy, it easily attracts fur, hair and dust, meaning a higher rate of cleaning. Shorter pile can stand up to high traffic but might not look as luxurious in a formal setting. A soft pile might be more comfortable but it wears out faster than short or shag pile. Thick pile is fantastic for high-traffic areas. These denser piles are more cushioned and stand up to heavy use. Thick pile does not always dictate quality, so be sure to check out the style of rug you’re buying too. Long pile rugs, also often called shag pile, can feel softer and luxurious but also attract dust and hair. They are also more susceptible to marking, where the pressure from furniture can leave indentations in the fibre. They can also, unfortunately, get caught in rotating vacuum bars, causing damage. Shorter pile, as a rule, is a great deal tougher than longer pile rugs. They are also easier to care for and are easier to clean. They also do not attract dirt or dust like shag or long pile rugs. Material is especially important when choosing a rug and the area it will go in. Some materials hold up better to high traffic while others are more traditional. Wool is one of the most common materials for rugs and is prized for durability as well as softness. It is strong, with good stain repellence. It is well known for being a fantastic insulator and is cosy underfoot. However it readily absorbs humidity and subject to fading. Silk rugs look stunning. They are luxurious, lush and soft, and feature a subtle sheen. It creates an easy, sumptuous feel in a room with finer details than can be achieved with wool. They will always require professional cleaning, however, and tend to show footprints. Cotton is frequently used to create flat-woven rugs including dhurries and kilims. It is more affordable than wool or silk and easier to clean. However they do not wear well over long periods of time. Highly durable, natural fibres combine to create an earthy, natural palette with rich textures. They are very strong and typically free from chemical processes. They can be coarse, however, and tough to clean. Modern, man-made fibres include viscose, nylon, and polypropylene. These have been created and recreated over the years to mimic natural fibres. They are good for damper environments and family friendly, but they don’t have the luxury of more traditional fibres. Rugs are often the centrepiece of the room and become an integral part of the home. If your rug needs a little tender love and care, contact Woods Rug Laundry today!